Here is another installment of what I did last summer (actually the summer before that, even). I made 3 white t-shirts using two different sewing patterns. 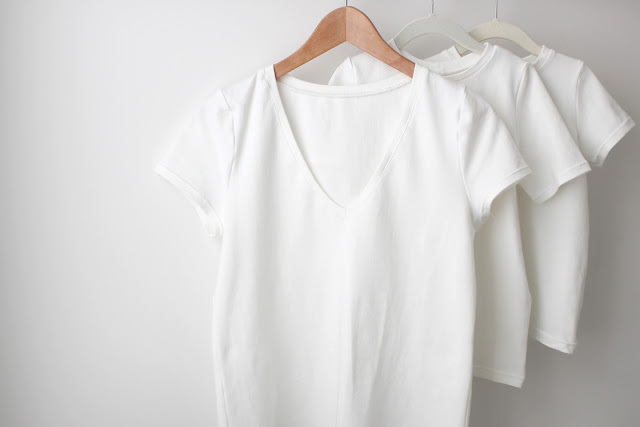 White t-shirts are often overlooked for more complicated projects but I think summer is the perfect time for easy, breezy, fast sewing projects. I made this white t-shirt during #simplesummersewing that I hosted a few years ago with Petit a Petit + Family basics like this took center stage. A simple t-shirt is perfect for hot weather, quick to sew, and gets lots of wear. I’m wearing a short sleeve v-neck Lark Tee by Grainline Studio. The kids are wearing School Bus Tees from Oliver + S. J is wearing view A, and L is wearing the more feminine view B sleeve options. I came across some really high quality jersey knit at my local fabric shop in Philadelphia. Fabric this good had to be made into t-shirts immediately! They are the simplest of summer sewing. If you're in the market for a new white tee my new favorite jersey is the Telio Organic Cotton jersey*. It's a bit lighter than this fabric, and has a really nice drape and recovery. *Fabric.com links are affiliate links. Opinions are my own. You're absolutely right that a white Tee is an absolute wardrobe basic and with so many beautiful high quality white knit on the market right now it's the perfect time to make a few. Love your lark in white! Thanks Kathleen! I think i have 3 white tees at the moment. :) When you can sew, you can never have too many!